Linear porokeratosis is characterized by linear hyperkeratotic papules and annular plaques arranged along the Blaschko lines. Here we report a case of linear porokeratosis and describe the dermoscopic features for the first time. 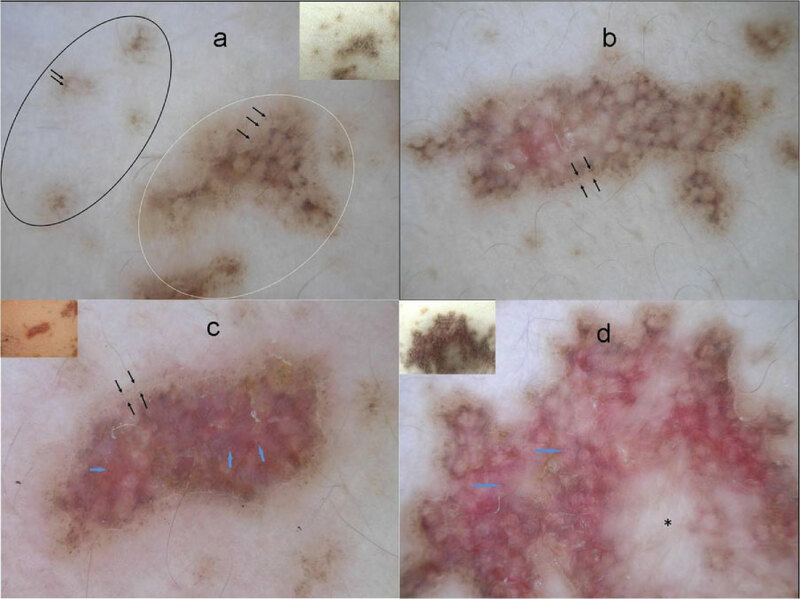 Dermoscopic and histopathological features of the linear porokeratosis were evaluated. In this report, we point out "the variation of the dermoscopic findings of linear porokeratosis in relevance to the age of the lesions". And we described new dermoscopic features like "the gray-brown pigment network-like appearance", "the reddish vascular network" in linear porokeratosis. The findings of this report may help to improve the diagnosis. Linear porokeratosis is a rare form of porokeratosis which usually occurs in early childhood. It is characterized by linear hyperkeratotic papules and annular plaques arranged along the Blaschko line . A 22-year-old-woman admitted with linear brownish papules and plaques on the right side of the trunk. The lesions initially had appeared on the right mammary at the age of 2-months and disseminated regionally throughout the axilla. The patient was previously followed with the diagnosis of epidermal nevus by some other physicians. On dermatologic examination, red-brown hyperkeratotic linear and annular plaques with elevated borders extending from the right mammary to the right axilla along the Blaschko lines were observed. Central atrophy and erythema were prominent in the older lesions; whereas mild erythema and keratosis were present in the recently developed punctuate and papular ones (Figure 1). The dermoscopic features observed in the case varied according to the age of the lesions. The "early" papular lesions exhibited peripheral, thin whitish-yellow "thread-like structure" together with brown-black dots at the inner side (Figure 2A, black circle). The early plaques revealed the same peripheral thread-like structure, however the dots were at the outer side and the ones in the inner part coalesced to form a gray-brown "network-like appearance" (Figure 2A, white circle). The early larger plaques showed linear arrangement of these dots both in the inner and the outer side of this thread-like peripheral structure, thus appeared as a "whitish-yellow track" together with a network-like appearance at the center again (Figure 2B). The "mature" plaques showed the peripheral whitish-yellow track together with a central "reddish vascular network" instead of gray-brown network-like structure (Figure 2C). Finally in the oldest lesions central "pinkish-white scar like area" accompanied the features of the mature plaques (Figure 2D). A mature lesion with representative dermoscopic features was totally excised in order to evaluate the histopathological counterpart of the observed dermoscopic findings. Histopathological examination from the edge of the lesion revealed cornoid lamella formed by parakeratotic keratinocytes together with orthokeratotic hyperkeratosis, absence of the granular layer below the cornoid lamella, focal vacuolar degeneration of the basal layer, an intense lichenoid lymphocytic infiltration in the dermis and aggregates of melanophages on the both sides of cornoid lamella in the superficial dermis. The central portion of the lesion showed multiple cornoid lamellas. Between these cornoid lamellas, the epidermis was atrophic together with dermal fibrosis, increased dilated vascular structures and multiple melanophages. Despite the presence of melanophages in the superficial dermis on the both side of cornoid lamella, there were no melanophages below the cornoid lamellas (Figure 3A). Additionally, immunohistochemical examination with HMB-45 and Masson Fontana silver stain revealed that the number of melanocytes was normal below the cornoid lamella; however there were no melanin pigment accumulation at these sites (Figure 3B). Differential diagnosis of linear dermatosis along Blaschko's line includes inflammatory linear verrucous epidermal nevus, linear lichen planus and linear porokeratosis . Characteristic dermoscopic feature of linear lichen planus is wickham strias . Dermoscopy of verrucous epidermal nevi reveals large brown circles . In our case none of these dermoscopic features were exist and by the finding of "cornoid lamella"which is the most peculiar dermoscopic feature of all variants of porokeratosis , we focused on porokeratosis. Because of tne linear configuration of lesions along the Blaschko lines we consider the patient as linear porokeratosis. Dermoscopic features of porokeratosis have been firstly defined by D,Amico, et al. in 31 lesions of 10 patients with Porokeratosis Mibelli (PM) . Subsequently, dermoscopic features have been reported in case reports in the literature, none of which exhibiting linear porokeratosis [3-8]. The related data has been summarized in Table 1. In the present case, dermoscopic findings of linear porokeratotic lesions were common with the previous reports in some aspects; however there were also some distinct features. One of the common features was the whitish-yellow track [4-7]. However, in this case this structure was observed as "whitish-yellow thread-like" in early lesions and seen as "whitish-yellow track" in more mature ones. The other common features were the brown dots and/or globules conjoined to form a continuous line inside a whitish rim , pinkish- white scar like areas in the central portion [7,8] and dotted vessels [3,4]. On the other hand, the observation of the variation of the dermoscopic findings according to the age of the lesions and the presence of the gray-brown network-like areas in the central portion of most of the lesions were the distinct features of this case. Furthermore, these gray-brown network-like areas were observed to be replaced by a reddish vascular network in the center with the maturation of the lesions. In our case, the gray-brown network in the inner side of the lesion corresponded to the presence of aggregates of melanophages in superficial dermis located on the both sides of the multiple cornoid lamellas, but lacking under them. Thus, cornoid lamellas formed the whitish-yellow holes and the aggregates of melanophages made up the gray-brown lines giving a pseudo-pigment network-like appearance. Likewise the whitish-yellow track at the periphery corresponds to cornoid lamellas; linear dots by the cornoid lamella on both sides correspond to the aggregates of melanophages in the superficial dermis. The central reddish vascular network replacing the gray-brown network in mature lesions, were due to enlarged and dilated vascular structures perhaps increased with time, seen between the cornoid lamellas in an atrophic skin. 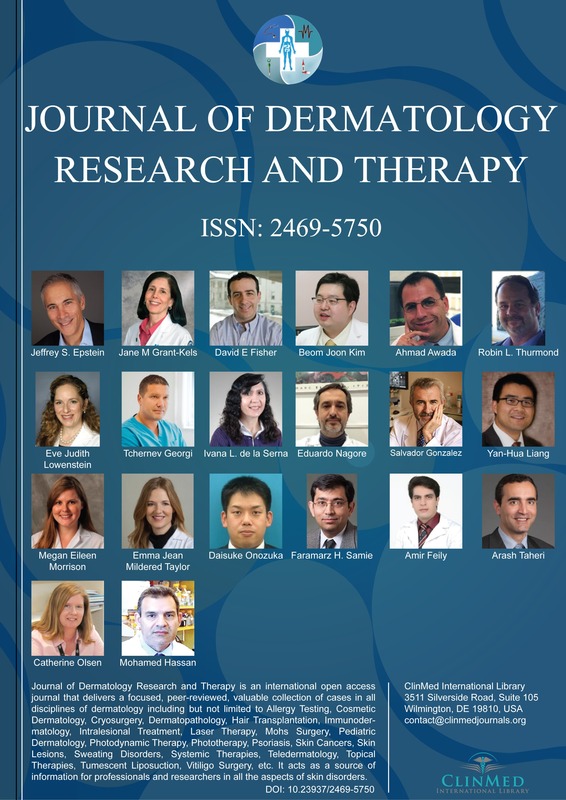 In this report we wanted to point out "the variation of the dermoscopic findings in relevance to the age of the lesions" and new dermoscopic features, "the gray-brown pigment network-like appearance, the reddish vascular network" which may help to improve the diagnosis of linear porokeratosis. Tay YK, Ong BH (1999) Linear warty lesiond in a child. Linear porokeratosis. Arch Dermatol 135: 1544-1545. Kim DW, Kwak HB, Yun SK (2017) Dermoscopy of linear dermatosis along Blaschko's line in childhood: Lichen striatus versus inflammatory linear verrucous epidermal nevus. J Dermatol 44: 355-356. D'Amico D, Vaccaro M, Guarneri C, Borgia F, Cannavo' SP, et al. (2001) Videodermatoscopic approach to porokeratosis of mibelli: A useful tool for the diagnosis. Acta Derm Venereol 81: 431-432. Pizzichetta MA, Canzonieri V, Massone C, Soyer HP (2009) Clinical and dermoscopic features of porokeratosis of Mibelli. Arch Dermatol 145: 91-92. Zaballos P, Puig S, Malvehy J (2004) Dermoscopy of disseminated superficial actinic porokeratosis. Arch Dermatol 140: 1410. Panasiti V, Rossi M, Curzio M, Bruni F, Calvieri S (2008) Disseminated superficial actinic porokeratosis diagnosed by dermoscopy. Int J Dermatol 47: 308-310. Delfino M, Argenziano G, Nino M (2004) Dermoscopy for the diagnosis of porokeratosis. J Eur Acad Dermatol Venereol 18: 194-195. Lallas A, Giacomel J, Argenziano G, García-García B, González-Fernández D, et al. (2014) Dermoscopy in general dermatology: Practical tips for the clinician. Br J Dermatol 170: 514-526. Meltem Turkmen, MD, Department of Dermatology, Izmir Bozyaka Training and Research Hospital, Izmir, Turkey, Tel: +90-250-50-50. © 2019 Turkmen M, et al. This is an open-access article distributed under the terms of the Creative Commons Attribution License, which permits unrestricted use, distribution, and reproduction in any medium, provided the original author and source are credited.